The judges have made their decision and it's time to reveal the winner of the A.Vogel Herbamare® cookery competition! In October this year we teamed up with A.Vogel, creators of Herbamare® seasoning salt, to launch a special cookery competition. We invited readers of Your Healthy Living magazine to put their culinary skills to use and devise a healthy and tasty recipe using Herbamare®. After much deliberation, we are pleased to announce that our winner is Teresa Shardlow with her recipe for herby lentil burgers. Teresa has won dinner for two cooked by Aldo Zilli, at either of the San Carlo Cicchetti restaurants in London! Teresa said: "I am delighted to know that the judges thought that my use of Herbamare® in herby lentil burgers was a winning dish. 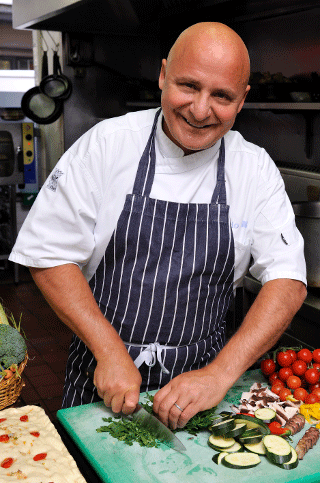 I am also looking forward to eating an authentic Italian meal cooked by Aldo Zilli. Indeed, I have one of Aldo's cookery books which I hope to ask him to sign for me. My inspiration for this recipe was to make a healthy meal which could be enjoyed by and appeal to my family. 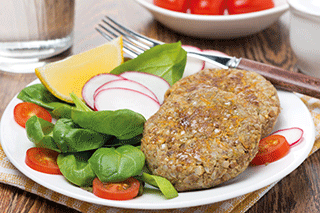 Herby lentil burgers are healthy because of the protein and vitamins in the lentils and vegetables. They appeal to my family because burgers are always a popular choice especially when enhanced by the flavour of Herbamare® fresh herb sea salt." The three runners-up were Denise Walker, Randi Henderson and Mandy Davies who won an A.Vogel food hamper worth £75 plus a copy of Zilli Light and Fresh & Green by Aldo Zilli. Celebrity chef and competition judge, Aldo Zilli, said: "I was delighted to be asked to judge the Herbamare® competition in Your Healthy Living magazine, especially as I am such a fan of using it in my cooking. There were some hugely inventive entries and I must admit I found it pretty hard to pick a winner – I think I'll be trying out some of the recipes at home as I am always looking for new healthy dishes to cook for my family – the kids already love the lentil burgers! I'm looking forward to cooking for the winner as I love meeting fellow foodies!" 1. Drain the lentils and rinse. 2. Heat 1 tbsp oil on a low heat and sauté the onion and garlic for 5 minutes. 4. Stir in the water, carrot, 1 tsp Herbamare® and black pepper. Simmer for 30 to 40 minutes or until the lentils are soft. 5. Stir in the breadcrumbs. Mix well. 6. Leave to cool for several hours until cool enough to handle. 7. Put non-stick paper onto a baking tray. Grease the paper and put an 8cm plain cutter onto the baking paper. Divide the mixture into four and make four burgers by spooning the mixture into the cutter and smoothing the top. Lift up the cutter after each burger is made. Chill the burgers for 30 minutes. 8. Put the oven on gas mark 5/190C/fan 160C. Brush the burgers with oil. Cook for 25 to 30 minutes until piping hot. A.Vogel Herbamare® seasoning salt is made from sea salt and 12 different fresh organically grown vegetables, garden herbs and iodine-rich kelp. The extra flavour imparted by the garden fresh herbs and vegetables in Herbamare® means that you can obtain as good a flavour in your food, if not better, by using less than your normal amount of salt. It is 100 per cent natural, unrefined and free from artificial flavours and preservatives. There are three varieties available: Herbamare® Original, Spicy and Low Salt. Herbamare® is available from all good health food shops.